Observation and Field of Fire – The potential offered to observe enemy maneuver and the fields of fire (areas) we have in terms of the range and other characteristics of our weapons (Basically how far/where we can see and what locations we can place at least harassing fire on to hamper threat maneuver). When evaluating both observation and fields of fire it’s important to consider cover and concealment from the threats perspective. Cover and Concealment – Routes and locations we can use to provide protection (Cover) from threat direct and indirect fire as well as hiding our presence (Concealment) from threat observation (Basically where are we protected from being hit and where are we protected from being seen). REMEMBER: Concealment doesn’t always equal cover. 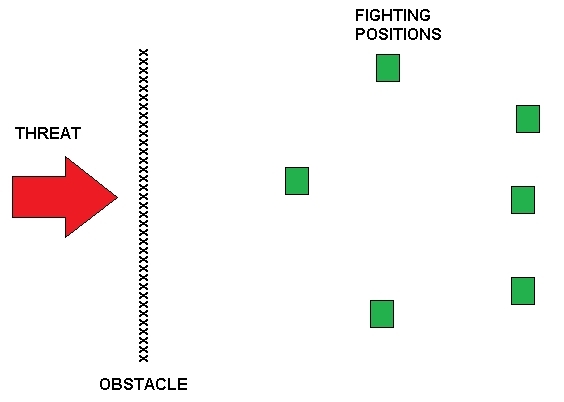 Obstacles – The natural and man-made features and measures designed that disrupt, turn, fix, block, or canalize a threat force and protect friendly forces from threat assault either directly or to the flanks (sides). When I address obstacles I’m going to look at two main types – dismounted and mounted. Dismounted obstacles are designed to accomplish the stated tasks against a threat moving on foot or light vehicle (i.e. ATV). Mounted obstacles are designed to accomplish those measures against vehicles. Key Terrain – Hills, plateaus, or other terrain features which could provide an advantage to the element occupying that position. For our purpose this also includes locations in our immediate AO that provide defensible positions. Avenues of Approach – The most likely expected routes of threat approach to a particular location. This includes High Speed Avenues of Approach by vehicle (see the last blog entry) and likely routes a threat on foot would take to reach our position. Now normally when an Intelligence Preparation of the Battlefield (IPB) is conducted by the military OCOKA is used to determine key terrain. It’s also used down to the troop level in locating fighting positions (foxholes) and positioning key weapons. With some restrictions we’re going to use it for the same thing. I stated above that our final defensive position (the house) is already on the ground. This doesn’t mean you can’t defend from other locations – quite the opposite. As I go along and develop this case study we’re also going to go into implementing other defensive principles like Defense in Depth. More on those below. The threat has a larger possible visual observation area than we do. Why? Simply stated the threat has the capability to remain concealed from a lot of these positions while observing (and thereby placing possible precision rifle fire on) our positions. The key thing I want you to take away from this portion is that your ability to interdict a threat is directly related to your ability to observe said threat. By understanding how lethal fields of fire are developed in conjunction with your ability to observe a threat your lethality improves almost exponentially. The next item I’m going to cover is Cover and Concealment. These concepts are worthy in themselves of an entire blog entry and I may cover them later but for now you need to be able to distinguish between the two. Cover is anything that protects you from either direct or indirect fire. Cover = mass and mass stops projectiles. Mass doesn’t always mean you are out of the enemies observation. As an example if you are inside the house and the walls are strong enough to withstand threat direct fire you are under cover. But if the threat knows you’re in the house then he has fixed your position. Sure you have some concealment (the threat doesn’t know your exact location in the house) however the threat knows you are in the house. That leads into concealment. In the traditional sense concealment is measures taken to prevent threat observation of you and your activities. Types of concealment are camo nets, working inside buildings to avoid observation, etc. Basically keeping the threats eyes off of you and your activities. Concealment is normally NOT cover in that most of the time it won’t stop threat projectiles. Concealment can also cover measures designed to deny spectral imaging (think IR camera on a UAV, night observation devices, etc.) The most basic way to implement concealment is to reduce your signature. By reducing your signature you give the threat less activity to look at. Basic examples of implement signature reduction including things like working on and parking vehicles inside of buildings, allowing exterior fields to lay fallow giving them the appearance of being unattended, allowing grass to grow on top of a defensive position, etc. 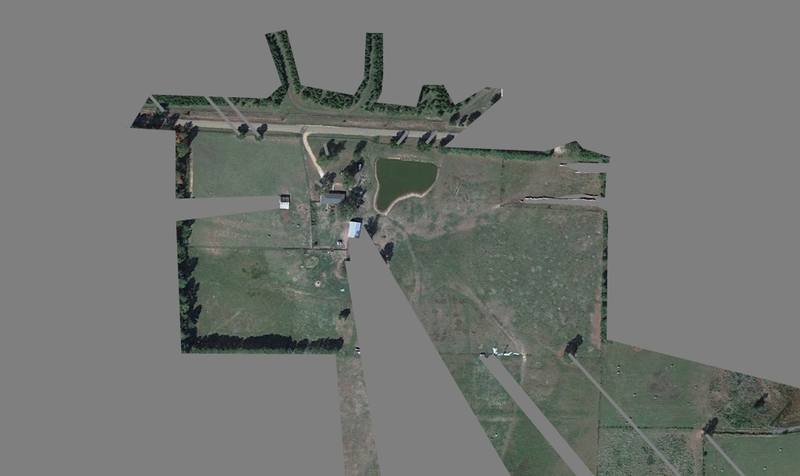 Make you immediate AO look unused or unoccupied. There’s a small chance the threat may bypass it if they think it holds nothing of value or has already been picked clean. When I get into passive defense measures I’m going to address both cover and concealment in further detail as they relate to some of the things we’ll implement in this case study. Obstacles are measures that will probably only slow the threat down and not stop them entirely. Any obstacle that will slow the threat down during its attack is also probably going to slow you down if you have to bug out. The most effective obstacles are those we can observe and place precision fire on. Unobserved obstacles should be kept in mind as “tentative slowing measures” only. Observed obstacles have one characteristic that makes them a huge asset: They can help you attrit the threat by being inside his OODA loop while he is dealing with said obstacle. Given that characteristic if the threat believes you can place precision fire on an obstacle that has little to no cover or concealment nearby it will most likely avoid that obstacle altogether unless it’s incredibly desperate or it has the ability to provide supporting fire to force your head down while it deals with that obstacle. Obstacles typically come in two flavors – natural and manmade. A natural obstacle could be something as simple as a wide and deep pond, a cliff, a dense patch of thorny cactus, etc. Manmade obstacles include wire, dropped logs into roadways, cut ditches etc. Another thing to consider when looking at and implementing obstacles is as I stated above they may provide cover or concealment for the threat. For example if you drop a couple of logs across your driveway you might keep vehicles out but at the same time you are also providing cover for the threat on foot (and you may hamper your ability to GTFO dodge in a timely manner). Obstacles are a double edged sword and need to be implemented with the most thorough planning you can muster. Make sure you include planned and future obstacles in your wargaming as well. Key Terrain for our purposes is going to consist of a few different types of things. Given our Defensive Priorities we’re going to assume first off that any planned routes we’re going to take if we decide to shag out is going to be not just key but critical terrain. Then we’re going to look at areas that are crucial to our ability to defend our immediate AO. This will probably include things like woodlines and buildings. When it comes to thinking about buildings as key terrain you need to be highly critical. Ask yourself “can I defend from this structure?” and “Is this structure likely to be used as cover by the threat?”. Depending on the answers to those questions and a little bit of wargaming will help you determine the criticality of a building in relation to your defensive plan and your prorities. Also something to consider about terrain (especially pastures) is if that piece of terrain is going to allow you to dominate your immediate AO. 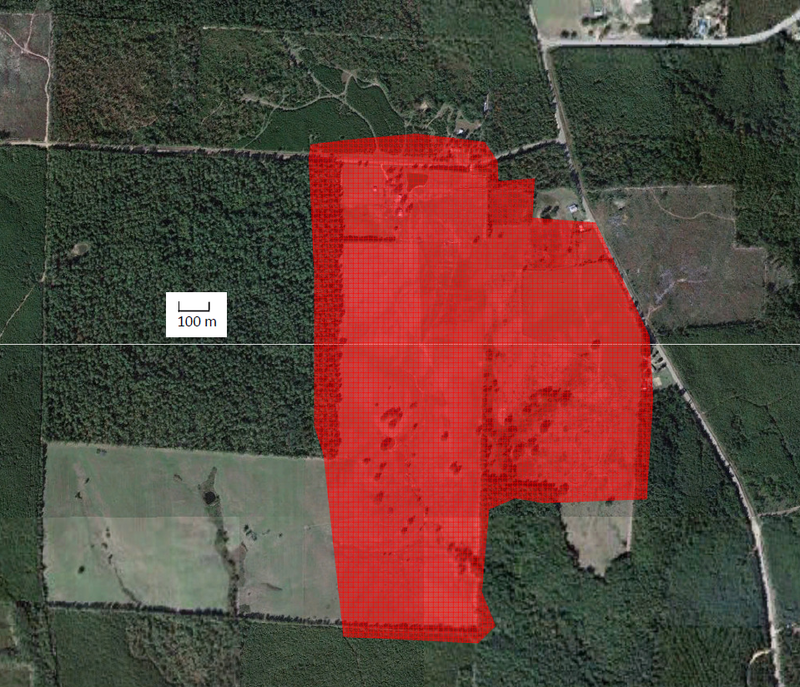 An open pasture is a pretty good killing zone but if you lose the capability to observe and place fire on it due to the threat maneuvering and gaining access into your “A Zone” then it’s become a critical piece of dirt. That’s the importance of determining key terrain. I covered Avenues of Approach in the last entry but I’ll touch on them briefly here. I break avenues of approach into two categories: High speed and dismounted – similar in category to obstacles but in this instance it’s the likely routes that a given threat will approach. Avenues of Approach also includes the main direction that we anticipate a threat attacking from (which I’ll refer to as the Axis of Attack). It’s critical to remember that it’s pretty common knowledge that successful single axis attacks are rare in history. 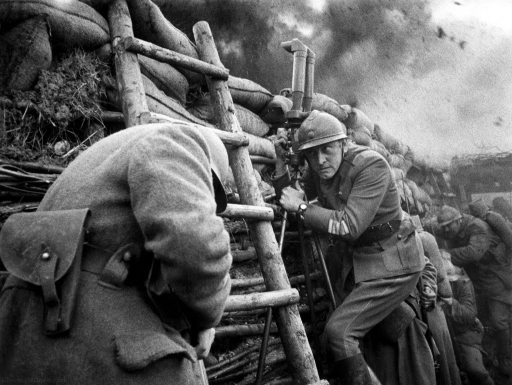 Flanking is as old as time itself and whatever you do don’t develop tunnel vision in thinking or reacting to an axis of attack. Expect things like smaller elements moving to your sides to flank your position, smaller elements conducting diversionary attacks (especially if they don’t appear to be firing and maneuvering), and feints (attacks that seem to be coming at you but all of a sudden slacken off – and are normally followed by a much larger attack shortly after when the threat will presume you are less vigilant while conducting activities such as caring for wounded, putting out fires, etc – which we call reconstitution). I’m going to take a second here to address two characteristics of defense. Those characteristics being Active and Passive Defense. I’m going to define them and I’d like for you to keep the differences in mind as this case study progresses. Active Defense is any measures we take to actively interdict and engage a threat. Normally active defensive measure include your selection of certain types of weapons for certain targets along with how you employ those weapons. Active defensive measure can also include spectral measures (i.e. jamming, blinding through the use of light/lasers). Passive Defense are measures that are “passive” meaning that they are emplaced and don’t require active engagement to function. Examples of passive defense are obstacles, early warning devices, hardening of structures, concealment measures, developing redundancy, dispersion techniques, OPSEC, and any measures you take to frustrate threat observation, fire, and maneuver. When it comes to developing a defensive plan there are a few techniques and methodologies that we need to keep in mind as well. The basic principle of Defense in Depth is a must. Defense in Depth is a combination of defensive measures (both active and passive) working in conjunction to keep the threat engaged and frustrated during an attack. With defense in depth the threat should come under ever increasing heavier fires as it nears its objective (i.e. your position). The basic premise behind defense in depth is to attrit an enemy so severely that prior to reaching his objective he is either destroyed or forced to break off his attack because of losses. Being able to engage an obstacle from multiple hardened position to the rear while the threat is trying to deal with that obstacle is a basic example of defense in depth. A basic diagram depicting defense in depth is below. Notice that as the threat advances along its axis it will come under ever increasing fires and that we don’t have just a single string of positions. The positions are sited so that as the threat advances the number of positions that can and will engage it increases. The next concept is mutual support. Mutual support is the ability to cover another positions deadspace thereby preventing the threat from moving or engaging in and from that deadspace. I’ve illustrated it in the diagram below. 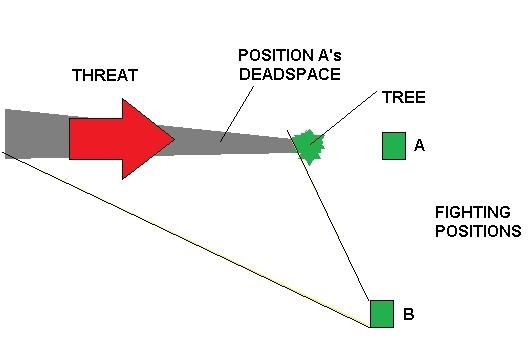 In this instance position A may not be able to see and thereby not engage the threat due to the deadspace created by the tree. However position B’s field of fire (the black lines) can engage to cover the threats advance towards A.
Interlocking fires (also called overlapping fires) is positioning weapons so their engagement envelopes overlap. Positions that allow for overlapping fires normally also give you the capability to catch the threat in a “crossfire”. In this instance both A and Bs fields of fire (the black lines) converge and both can engage the threat simultaneously. 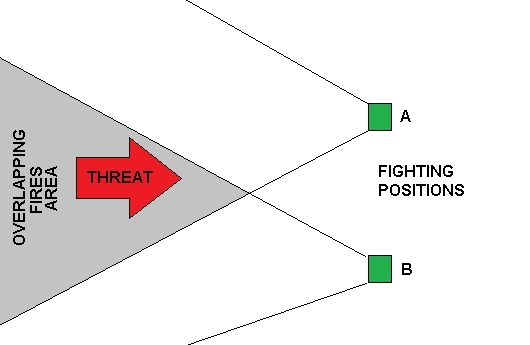 This creates a huge problem for the threat as it is now faced with the problem of having to possibly focus on engaging one position with massed fires at the risk of being torn up by the other position or using a spread of fewer weapons against both positions which may not give them fire superiority against either one or both positions. Early Engagement is your ability to engage the threat outside of their ability to engage your point defense (i.e. the house). This can be achieved either through the use of longer range weapons, siting fighting positions further out in your defense, and the use of “non monitored interdiction devices” (ya like that one? ). The premise behind early engagement is that you’ll begin to engage the threat well before it begins its attack. Ambushes are a form of early engagement. Some folks also call early engagement “proactive defense”. Another useful concept is employing a mix of weapons if you have a variety. It’s sound judgment to site a semi-auto rifle in a mutually supporting position with overlapping fire to cover a guy with a bolt action versus placing all of your bolt action rifles in one area. The same thing goes with massing firepower. Massing firepower is quite often an on the spot judgment call that is made when you believe that the main effort of the threat has been identified and you want to bring as much firepower to bear on it as you can by relocating weapons. Whatever you do if you decide to mass weapons make sure your other avenues of approach still have coverage. It’s not a good idea to bring every weapon to bear if it requires you to leave that eastern approach completely unmonitored. The key to using mass effectively is observation and communication. By leaving someone to observe that eastern approach if they see another threat element massing to attack from that direction and can pass that info along to you in a timely manner you’ll probably have a better chance to redistribute your firepower to counter that effort. Finally I am going to cover both weighted and balanced coverage. These are pretty simple concepts in that a balanced coverage allows a balanced distribution of fire from your position. A weighted coverage takes into accounts things like avenues of approach, probable axis of attacks, effective fields of fire and observation, and any other defensive measures. The most effective defenses usually use weighted coverage in siting key weapons (i.e. that .338 Lapua magnum would be more effective covering a road than a woodline 50 meters away). For further reading I suggest you take a look at the Army Field Manual 7-8 The Infantry Platoon and Squad particularly Chapter 2 Section V. Next up we’re going to dig finally into Zone C . I also suggest taking the time to read the Defense of Duffers Drift. Wikipedia has done a pretty good job at synopsizing it but as for the Original Text it can be found at Project Gutenberg.